He is the only two-time physics Nobel laureate, but few people know of John Bardeen. 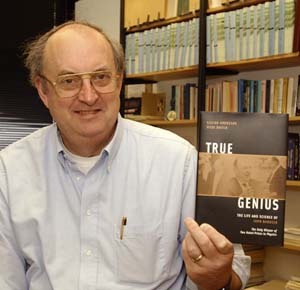 True Genius: The Life and Science of John Bardeen, by Lillian Hoddeson and Vicki Daitch, offers insight into the complex personality of a remarkable physicist who differed from the stereotypical image of a genius. Hoddeson distinguishes Bardeen as "true genius," because he was not just born with talent, but worked to cultivate it throughout his life. Hoddeson draws on a wealth of experience and knowledge of the history of the field as a physics historian at the University of Illinois. She has also archived Fermilab's historical records since 1977. A question plagued Hoddeson while she researched the book: "Why was a genius like John Bardeen so little known?" The answer, she said, was that he differed from the stereotypical image of genius, that of the exceptionallytalented but exceptionally-eccentric "mad scientist." Bardeen did not act outrageous or flamboyant. In fact, he was at the other extreme, speaking in a soft warble that many people found difficult to understand, earning him the nickname "Whispering John." He did not court the media, sending two of his graduate students—Leon Cooper and Robert Schrieffer—to make the first announcement of his superconductivity theory at an American Physical Society meeting. The theory won Bardeen a second Nobel Prize in 1972; the first, in 1956, was for the discovery of the transistor effect, with William Shockley and Walter Brattain. Bardeen's gifts were apparent at an early age. Letters that his mother, Althea, wrote her father-in-law, Charles William Bardeen, say that John "stood out" in most subjects from the day he started school, and that he "demonstrated a concentrated essence of brain." By the time he was nine, he had skipped enough grades to be in the same class as his brother, William, who was two years older than John and was ahead of his own age-group. In the summer after third grade, John mastered the mathematics of the fourth and fifth grades; in the fall, he mastered sixth, seventh, and eighth grade math. His exceptional mind isolated him from his classmates, probably helping him to further cultivate his genius. His classmates considered him too young for their games, leaving John with even more time to study. He was always far ahead of his class, throughout school and college. Even after taking a year off, he graduated with a bachelor's degree in electrical engineering from the University of Wisconsin at the age of twenty. A year later he obtained a master's degree in electrical engineering. Early family influences molded Bardeen's outlook. His mother taught her children to define their own problems and seek creative answers, a tool that John used in later years. His paternal grandfather, Charles William, stressed that the greatest opportunity was to serve. Bardeen sought out physics problems, such as the transistor, that he believed would directly benefit society. Few technological advances have so transformed society. Bardeen's work methods played an equal role in winning Nobel Prizes in two widely-varying different fields—the engineering-based invention of the transistor, and the physics-based explanation of superconductivity. During graduate studies in math at Princeton University, Bardeen learned from professor Eugene Wigner to break down problems into smaller pieces that were easier to handle. Wigner taught Bardeen to "reduce the problem to its bare essentials, so that it contains just as much physics as is necessary," Hoddeson tells us. Bardeen, it developed, was even more persistent than his mentors in tackling problems. He "bullied" through difficulties, seeking alternatives if one method failed, until he found the answer. He also had an encyclopedic knowledge of physics, which his colleagues found invaluable as a resource. Bardeen spent hours working and reading in the library, but preferred not to work in isolation. He enjoyed working in collaboration, drawing on the expertise and knowledge of others. Bardeen's son Bill, a theorist at Fermilab, said he learned much about his father's working methods and his early life from Hoddeson's book. "I knew that the transistor was important, but not how it happened," Bill Bardeen said. "I was just eight years old at the time and [my father] spoke very little at home. We knew he was there if we needed him, but he never forced anything on us." John had a strong presence as a father even if it was a quiet presence, according to both Bill and the book. When Bill pitched in Little League, John coached him. John influenced his children's lives and career choices by holding up physics as a high calling. Bill always wanted to study physics, though he said his father would have preferred that he become an experimentalist rather than a theorist. Hoddeson's book, even with its many insights, has not dealt with every aspect of John Bardeen's complex personality. "There was more to him than what is in the book," said Bill. "This book is a great start, but there will be more biographies." Both authors, Hoddeson and Daitch, concur. In the book’s preface, they write, "We are painfully aware that this book merely scratches the surface of the subject." Hoddeson said the book would have benefited had she begun it while Bardeen was alive, and had a chance to question him about his thoughts on his life and science. Hoddeson says most of her research was conducted through interviews with Bardeen's family, friends, and colleagues, and through family letters. The letters are in the basement of the home of Bill and his wife Marge, who is head of the Education Office at Fermilab. But Hoddeson does know that John Bardeen would have picked her to write his biography. In the course of her research she came upon some correspondence between Bardeen and one Mr. Jefferson Bushman, who asked if he could write a biography. Bardeen replied that if anyone were to write his biography, it would be Lillian Hoddeson.